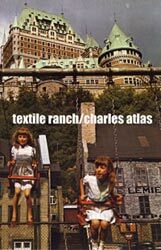 As the title suggests, this is a split EP comprising of four numbers by Textile Ranch and two by Charles Atlas. I will resist all urges to say that the latter are the, er, stronger, because a) it'd be a pretty rubbish joke and b) it wouldn't necessarily be true. I'm not sure about the opening track Murderer/Gardener as the dreamy, almost folky vocals by Susanne Bauszat jar against the backdrop and a beat that resembles the postman knocking on your front door. The other three tracks by Textile Ranch, however, are instrumental and with all due respect to Susanne, are all the better for it. Bear Is Ours and We Both Hurt Our Heads should appeal to fans of the Aphex Twin, with the latter number a particular highlight. Huguenots is the final Textile Ranch contribution and is an ethereal sounding number with a synth playing over a beat that sounds like your dad building a shed. Oakland is a thirteen minute, slow, spacious sounding instrumental with a piano-led melody. An acoustic guitar plays in the distance whilst the beat changes in the background. The opening is maybe a little too easy-listening, but as it develops it becomes apparent that we're not a million miles away from the type of instrumentals that Hood do so well here. Then, the track goes off in a more "plane coming into land on a runway" direction. Genova, which closes the cd, features some pretty piano playing that leads us into Moon Safari-era Air territory. A really good track! So…a good release. And one where it's fair to say that the two acts complement each other well.